Pork Chops Supreme is a favorite comfort food pork chop recipe that my family loves. This was one of my favorite recipes to make when I was just learning to cook. The recipe originally came from the Betty Crocker Cookbook from the 1960s. My mother gave me this cookbook when I got married. It was one of the first dishes that I every cooked. My husband loved it then and he still does! * Chili sauce or your favorite barbecue sauce may be substituted. Sprinkle both sides of the pork chops with salt and pepper. Place pork chops in an ungreased shallow baking pan. Top each pork chop with a onion slice, a lemon slice, 1 tablespoon brown sugar, and 1 tablespoon ketchup. Cover and cook for approximately 20 minutes. 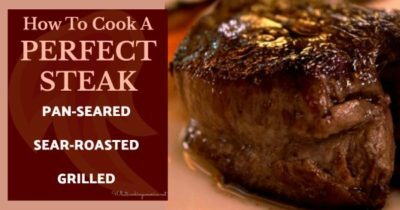 Uncover and cook spooning sauce over the chops occasionally, an additional 29 to 30 minutes or until the internal temperature reaches a temperature of 155 degrees F. on a meat thermometer. Remove from oven and serve.